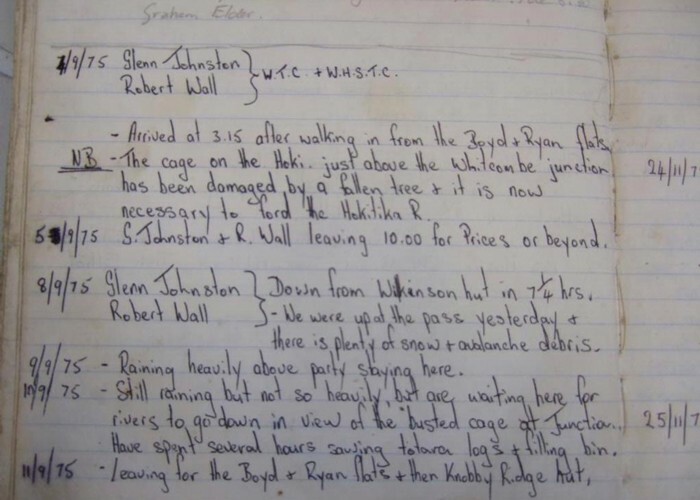 That visit to Wilkinson hut in 1975 when returning from the Whitcombe Pass was the only visit I'd made there until earlier this month. I didn't take a photo of Wilkinson hut back in 75 but made sure I did this time! The WTC was the old Westland Tramping Club which went into recess some time in the 1980's. Andrew Buglass of Permolat fame was the newsletter editor. Rob Wall my tramping mate on that trip joined the Wildlife Service & later DOC before retraining & now manages a hospital in the Australian outback. The Junction hut, not far from the damaged cableway (cage) that is mentioned, was removed long ago. The Knobby Ridge hut (not the biv) where we were off to burned down later on. glennj My old mate Rob Wall passed away last month in Australia. He was ex NZ Wildlife Service & loved the NZ backcountry. glennj Rob & I had hidden our motorbikes near the long gone Knobby Ridge Hut which you used to be able to get a bike or 4x4 to. glennj Perhaps the books were kept neater then? It's a bit spooky that some have survived and are now archived! Added 16 April 2012 by glennjglennj. 1 revision 20 April 2012 by glennjglennj. 15 views in the past year (1 per month).